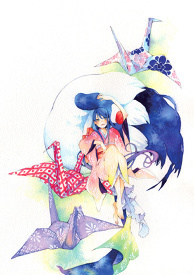 I'm a painter who loves watercolors, kimonos, and girls. Flyer for the 2012 group exhibition "Yukata Assembly (Yukata-kai)"
Flyer for the 2013 group exhibition "Yukata Assembly"
Flyer for the 2009 group exhibition "Illusions in Japanese Style (Wafuu Gensou)"
Born and living in Tokyo. 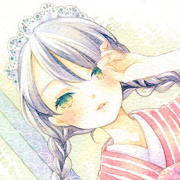 After my debut with the illustrations of the &OpenCurlyDoubleQuote;Ayakashi no Kagami”r; series that started in 2008, I’r;ve been doing illustrations and cover designs for novels, children’r;s books, and magazines. I periodically participate in Comitia and Design Festa, and also postcard and group exhibitions. 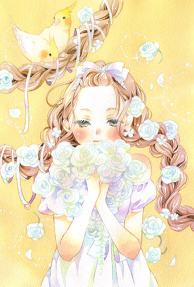 I am dedicated to the soft colors of transparent watercolors, and I mostly paint girls in Japanese clothes. 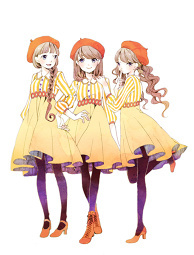 In addition, I was responsible for the performance posters of the Merry-Go-Round troupe between 2011 and 2013. I got into oekaki BBS pictures for coloring, and the friends I made in that period recommended watercolors to me, and so I started using transparent watercolors. When I heard that Asuka Shinsha was launching &OpenCurlyDoubleQuote;Small S”r;, I submitted some illustrations. 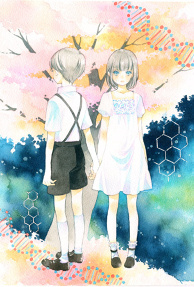 They were published in the first issue, and I started to receive illustration and manga requests from them. I started participating in S-camps, going to Comitia with friends and participating in postcard exhibitions, which increased my opportunities for painting. and the embedment of the characters&apos; feelings. Between a day and a week. A colored picture usually takes about two days. and when I doze off taking a bath.